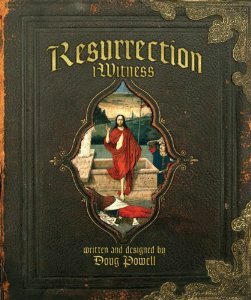 Upon first look at Doug Powell’s innovative book, Resurrection iWitness, I was already impressed with it’s aesthetic appeal; not a typical feature of an argument-based apologetic work. With further exploration, I realized there was great potential for impact of the material, especially on children and students, as it utilizes tactile engagement in order to teach the foundation of belief in the resurrection. Do you have a child who is questioning belief in God? Perhaps, they are somewhat disconnected from the whole idea of the “resurrection” of Jesus. This book vividly brings to light the evidence and importance of the resurrection of Jesus, but does so in a way that will engage their imagination. It looks like a storybook and has been jokingly dubbed “the resurrection pop-up book,” but its ingenuity lies in how it draws the attention of the reader to engage in learning. Of particular interest to me was the “Martyr’s Map” in which the locale of each martyr’s death was depicted by a red pushpin on a black and grey map; such striking imagery. Though there are a few spots in which the type is a little small (due to formatting) the overall book is truly a masterpiece. After reviewing it with my own teenage daughter, as well as with our youth minister and his wife, I am convinced that this resource will be invaluable as a teaching aide for the most important doctrine of the Christian faith. I highly recommend this work for any Christian home or church as it will provide instruction for the young and act as a piece of intrigue for those unfamiliar with arguments for the resurrection.